ζ 37 850-41 350 3 500 1 ~ 10-3 ? ? ? ^ a b c d e f g h i j de Pater, Imke; Gibbard, Seran G.; Lebofsky, Hammel, H.B. (2006). “Evolution of the dusty rings of Uranus”. Icarus 180 (1): 186–200. Bibcode: 2006Icar..180..186D. doi:10.1016/j.icarus.2005.08.011. ^ Elliot, J.L. ; Dunham, E. and Mink, D. (1977). “The rings of Uranus”. Nature 267 (5609): 328-330. Bibcode: 1977Natur.267..328E. doi:10.1038/267328a0. http://www.nature.com/nature/journal/v267/n5609/abs/267328a0.html. ^ Nicholson, P. D.; Persson, S.E. ; Matthews, K. et al. (1978). 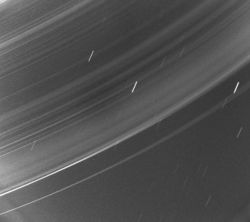 “The Rings of Uranus: Results from 10 April 1978 Occultations”. The Astronomical Journal 83: 1240-1248. Bibcode: 1978AJ.....83.1240N. doi:10.1086/112318. ^ Millis, R.L. ; Wasserman, L.H. (1978). “The Occultation of BD -15 3969 by the Rings of Uranus”. The Astronomical Journal 83: 993-998. Bibcode: 1978AJ.....83..993M. doi:10.1086/112281. ^ a b c d e f g h i j k l m n Esposito, Larry W (2002). “Planetary rings”. Reports on Progress in Physics 65 (12): 1741–1783. doi:10.1088/0034-4885/65/12/201. ISSN 0034-4885. ^ a b c d e f g h i j k l m n o p q r s t u v w x y z Smith, B. A.; Soderblom, L. A.; Beebe, R.; Bliss, D.; Boyce, J. M.; Brahic, A.; Briggs, G. A.; Brown, R. H. et al. (1986). “Voyager 2 in the Uranian System: Imaging Science Results”. Science 233 (4759): 43–64. doi:10.1126/science.233.4759.43. ISSN 0036-8075. ^ a b c d e f g h i j k Showalter, M. R. (2006). “The Second Ring-Moon System of Uranus: Discovery and Dynamics”. Science 311 (5763): 973–977. doi:10.1126/science.1122882. ISSN 0036-8075. ^ a b c d e f g h Burns, J.A. ; Hamilton, D.P. ; Showalter, M.R. (2001). “Dusty Rings and Circumplanetary Dust: Observations and Simple Physics”. In Grun, E.; Gustafson, B. A. S.; Dermott, S. T.; Fechtig H. (PDF). Interplanetary Dust. Berlin: Springer. pp. 641-725. http://www.astro.umd.edu/~hamilton/research/preprints/BurHamSho01.pdf. ^ a b c d e f g h i j k Ockert, Maureen E.; Cuzzi, Jeffrey N.; Porco, Carolyn C.; Johnson, Torrence V. (1987). “Uranian ring photometry: Results from Voyager 2”. Journal of Geophysical Research 92 (A13): 14969. doi:10.1029/JA092iA13p14969. ISSN 0148-0227. ^ a b c d e f g h i j k Lane, Arthur L.; Hord, Charles W.; West, Robert A. et al. (1986). “Photometry from Voyager 2: Initial results from the uranian atmosphere, satellites and rings”. Science 233 (4759): 65–69. Bibcode: 1986Sci...233...65L. doi:10.1126/science.233.4759.65. PMID 17812890. ^ a b c d e f g h i j k l m de Pater, Imke; Hammel, H. B.; Showalter, Mark R.; Van Dam, Marcos A. (2007). “The Dark Side of the Rings of Uranus”. Science 317 (5846): 1888-1890. Bibcode: 2007Sci...317.1888D. doi:10.1126/science.1148103. PMID 17717152. ^ a b Karkoshka, Erich (1997). “Rings and Satellites of Uranus: Colorful and Not So Dark”. Icarus 125 (2): 348-363. Bibcode: 1997Icar..125..348K. doi:10.1006/icar.1996.5631. ^ a b c d Baines, Kevin H.; Yanamandra-Fisher, Padmavati A.; Lebofsky, Larry A.; et al. (1998). “Near-Infrared Absolute Photometric Imaging of the Uranian System”. Icarus 132 (2): 266-284. Bibcode: 1998Icar..132..266B. doi:10.1006/icar.1998.5894. ^ a b c d dePater, Imke; Hammel, Heidi B.; Gibbard, Seran G.; Showalter, Mark R. (2006). “New Dust Belts of Uranus: One Ring, Two Ring, Red Ring, Blue Ring”. Science 312 (5770): 92–94. Bibcode: 2006Sci...312...92D. doi:10.1126/science.1125110. PMID 16601188. ^ a b c d e f g h Stone, E.C. ; Miner, E.D. (1986). “Voyager 2 encounter with the uranian system”. Science 233 (4759): 39-43. Bibcode: 1986Sci...233...39S. doi:10.1126/science.233.4759.39. PMID 17812888. ^ a b c d e f g h i j k l m n o Karkoshka, Erich (2001). “Photometric Modeling of the Epsilon Ring of Uranus and Its Spacing of Particles”. Icarus 151 (1): 78-83. Bibcode: 2001Icar..151...78K. doi:10.1006/icar.2001.6598. ^ a b Tyler, J.L. ; Sweetnam, D.N. ; Anderson, J.D. ; et al. (1986). “Voyger 2 Radio Science Observations of the Uranian System: Atmosphere, Rings, and Satellites”. Science 233 (4759): 79-84. Bibcode: 1986Sci...233...79T. doi:10.1126/science.233.4759.79. PMID 17812893. ^ a b c d e f g h Esposito, L.W. ; Colwell, Joshua E. (1989). “Creation of The Uranus Rings and Dust bands”. Nature 339 (6226): 605-607. Bibcode: 1989Natur.339..605E. doi:10.1038/339605a0. ^ Horn, L.J. ; Lane, A.L. ; Yanamandra-Fisher, P. A.; Esposito, L. W. (1988). “Physical properties of Uranian delta ring from a possible density wave”. Icarus 76 (3): 485-492. Bibcode: 1988Icar...76..485H. doi:10.1016/0019-1035(88)90016-4. ^ a b c d Porco, Carolyn, C.; Goldreich, Peter (1987). “Shepherding of the Uranian rings I: Kinematics”. The Astronomical Journal 93: 724-778. Bibcode: 1987AJ.....93..724P. doi:10.1086/114354. ^ a b c d Holberg, J.B.; Nicholson, P. D.; French, R.G. ; Elliot, J.L. (1987). “Stellar Occultation probes of the Uranian Rings at 0.1 and 2.2 μm: A comparison of Voyager UVS and Earth based results”. The Astronomical Journal 94: 178-188. Bibcode: 1987AJ.....94..178H. doi:10.1086/114462. ^ French, Richard D.; Elliot, J.L. ; French, Linda M. et al. (1988). “Uranian Ring Orbits from Earth-based and Voyager Occultation Observations”. Icarus 73 (2): 349–478. Bibcode: 1988Icar...73..349F. doi:10.1016/0019-1035(88)90104-2. ^ Gibbard, S.G.; De Pater, I.; Hammel, H.B. (2005). “Near-infrared adaptive optics imaging of the satellites and individual rings of Uranus”. Icarus 174 (1): 253-262. Bibcode: 2005Icar..174..253G. doi:10.1016/j.icarus.2004.09.008. ^ Chiang, Eugene I.; Culter, Christopher J. (2003). “Three-Dimensional Dynamics of Narrow Planetary Rings”. The Astrophysical Journal 599 (1): 675-685. arXiv:astro-ph/0309248. Bibcode: 2003ApJ...599..675C. doi:10.1086/379151. ^ a b Dunn, David E.; de Pater, Imke; Stam, Daphne (2010). “Modeling the uranian rings at 2.2μm: Comparison with Keck AO data from July 2004”. Icarus 208 (2): 927–937. doi:10.1016/j.icarus.2010.03.027. ISSN 00191035. ^ Goldreich, Peter; Tremaine, Scott (1979). “Towards a theory for the uranian rings”. Nature (Nature Publishing Group) 277 (5692): 97-99. Bibcode: 1979Natur.277...97G. doi:10.1038/277097a0. http://www.nature.com/nature/journal/v277/n5692/abs/277097a0.html.